Two years ago, a key partnership began between two organizations participating in the Center for Public and Nonprofit Leadership’s Summer 2016 Nonprofit Management Certificate program. After learning how complementary their missions were, Special Olympics and SourceAmerica began to work together to find ways to better serve the disability community. We spoke to our alumni to discuss the most recent developments in their partnership and their lessons learned. Shane Kanady, Certificate alumnus and Director of Government Affairs Special Projects at SourceAmerica, shared his insights about cultivating and developing the relationship with Special Olympics. Established in 1974, SourceAmerica is a Central Nonprofit Agency (CNA) with a mission to create employment opportunities and choices for people with significant disabilities. The organization does so by connecting its nationwide network of nearly 800 nonprofits to government and commercial opportunities, developing innovative new programs and engaging in advocacy on Capitol Hill. In the Summer 2016 Certificate Program, Kanady met Kirsten Seckler, Chief Brand and Communications Officer, and Denis Doolan, Chief, Organizational Excellence, who are both with Special Olympics. An internationally respected organization, Special Olympics provides year-round sports training and athletic competition in a variety of Olympic-type sports for children and adults with intellectual disabilities. Special Olympics also focuses on youth & schools and health programming, as well as an Athlete Leadership curriculum that offers a variety of skills to promote success in all avenues of life. Seckler, Doolan and Kanady quickly identified the opportunity to link skill development with employment outcomes for the population served by both organizations. One of SourceAmerica’s main objectives of the fair was to ensure that they were reaching as many athletes as possible. A unique and effective tactic in doing so came in the form of literal boots on the ground. SourceAmerica mapped out where people would be at given times after sports competition events, highlighting spaces with the largest amount of foot traffic. Representatives then stormed the streets in Special Olympics-SourceAmerica branded backpacks with high-flying “Ask Me about the Journey of Employment!” flags attached. Using this method, the SourceAmerica team promoted the job fair and their mission through one-on-one, individual conversations. “Whether someone came up to us wondering about the job fair, or to ask for directions to the next event, we were really able to talk to so many of them about the opportunities that were being offered across the country,” Kanady said. In addition to giving athletes the chance to learn about job openings, the fair was also a learning opportunity for the corporate partners who participated. In Seattle, global companies such as Microsoft, Amazon, and Starbucks were joined by local employers, including the University of Washington and the city government. Special Olympics athletes spoke to the job fair audience about how they’ve navigated the employment process and workforce, and SourceAmerica offered resources and information to help companies learn how to build an inclusive corporate culture. The job fair played an important role from an “advocacy and awareness-raising standpoint,” Kanady commented. Not expecting either organization to drift away from their priorities was crucial in maintaining a strong partnership. Special Olympics does not have a focus on employment as part of its mission, yet acknowledges how it is linked to its strategic goals. “We wanted to find a way to partner together without asking them to spend their resources or drift away from what was important to them,” Kanady shared. 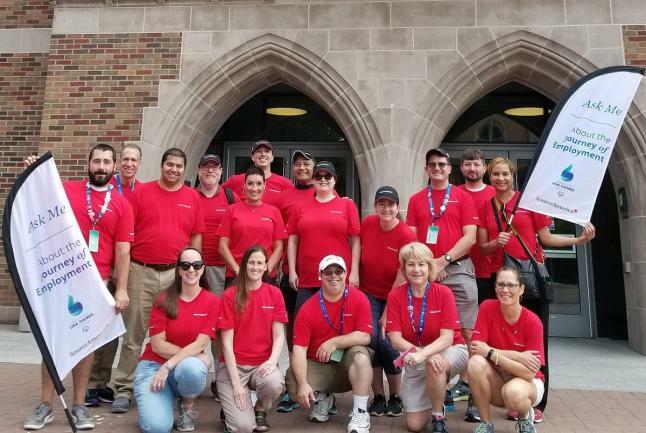 Through the partnership with SourceAmerica, Special Olympics recognized how professional opportunities open the door to providing healthcare, education, connection to their communities and economic stability to the athletes they serve. Learning how their respective organizations worked was important in forming a complementary partnership. Kanady built trust with his Special Olympics counterparts by understanding how valuable their corporate partners are to their model of success. This informed how his organization worked with the Special Olympics team to develop a strategy they were comfortable with to engage their corporate sponsors in the job fairs. Choose an appropriate pace – To be successful, partnerships must be built at the pace that works for both organizations. Often there is a feeling that work needs to be done quickly; however, it takes time to build the trust and clear direction needed for an effective partnership. Both organizations need to be on the same page as much as possible, so at times it is critical to slow down to ensure stakeholder buy-in. As trust and early successes are achieved, the pace can often pick up and the scope of the collaborative work can grow. Kanady shared that the exposure to the Special Olympics audience has been incredible, but so has the opportunity to interact with all their major partners. SourceAmerica has been able to engage many of its departments in the partnership (human resources, operations, marketing, etc,) leading to growth throughout the organization. Special Olympics has also benefitted from the connections SourceAmerica has brought to the table. Thanks to SourceAmerica’s association, the organizations are exploring a collaboration with the George Mason University LIFE Program and Kellar Institute of Human disAbilities. This introduces an academic partner to Special Olympics’ Athlete Leadership program, which works to improve the impact and performance of their leaders through mentoring, training, and support. Seckler highlighted how the partnership has helped support each other’s thought leadership initiatives. Over the past two years, representatives from each organization have been called on to speak at each other’s major events to promote inclusion. This included panel discussions in Austria for the Special Olympics World Winter Games, a Capitol Hill briefing on the Future of Work and People with Disabilities, and SourceAmerica’s annual national conference. Both organizations look forward to operationalizing more ideas and building from a foundation of authentic collaboration and trust. The ultimate goal is to create a link between the knowledge and skills Special Olympics Athletes acquire through sport and training to meaningful employment outcomes in their communities. Because of the complementarity between their missions, SourceAmerica and Special Olympics have the opportunity to fulfill this goal and make a significant social impact.